Planning one amazing party is more complicated than it sounds. Reece Ryan is known as the best wedding planner in town, but it’s time to take her company to the next level. 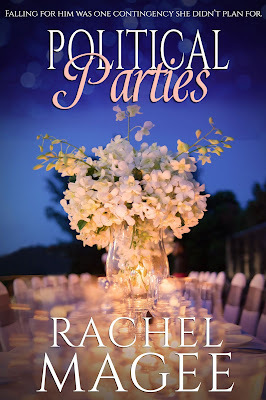 Getting the contract from a prestigious law firm to plan their upcoming political related events is just the break she needs to prove that she can put together more than just the perfect nuptials. Sure, these events which will receive national coverage might be slightly out of her league, but it’s nothing she can’t handle. Managing the hotshot lawyer the firm has tasked as their liaison for the project is a whole other story. Griffith Brighton always thought the start of his political career would come from hard work and his brilliant legal mind, not throwing some fancy party. But when the firm’s managing partner asks him to work with the event coordinator to organize a fundraiser dinner for the presidential candidate, he knows it’s the opportunity he’s been waiting for to get in front of some major political players. After years of goal setting and career planning, his future finally seems to be coming together …until two weeks of working with Reece make him reconsider everything he thought to be true about life and falling in love. The only thing Reece Ryan and Griffith Brighton have in common is their drive to succeed. They are opposite in almost every other way and, oh boy, does that make them memorable!. Reece is cheerful, friendly, perky and close to her family. Griffith is intense, brooding, and thinks an annual visit during the holidays can often be avoided. And those difference are stark when the two are thrown together to plan two big events for the law firm where Griffith works. As the two spend most of their waking hours together, they begin to admire the strengths of their differences. 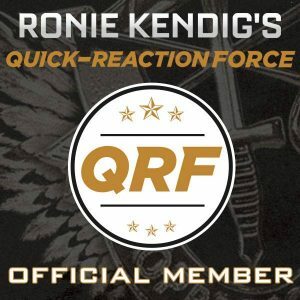 Reece shows Griffith how to cut loose and enjoy himself while Griff has a better handle on situations that cause Reece to freeze up. And the entire time, the attraction between these two heats from a slow simmer to a full-on roiling boil. When Reece and Griffith go to New Mexico, I was a little smitten with Griffith myself. (That’s all I’m going to say about that because you need to experience it fresh). While parts of the book were a little predictable, especially near the end, those same things are what made this read completely worth the investment. 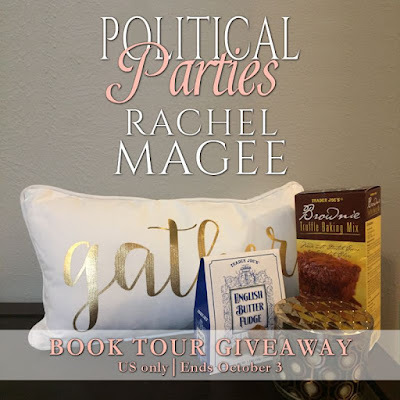 Political Parties is thoroughly enjoyable if you’re looking for a contemporary romance with some heart and depth. Rachel wrote her first novel when she was twelve and entered it into a contest for young author/illustrators. Unfortunately, the judges weren’t impressed with her stick figures. So she dropped the dream of becoming a world famous illustrator and stuck to spinning stories. When she’s not busy working on her latest book, she loves to travel with her family and friends. By far, her favorite destination is the beach, which tends to work its way into most of her stories. 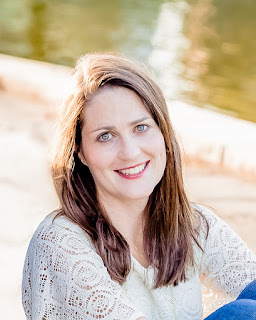 Between vacations, you can find her at home in The Woodlands, TX with her wonderful husband, their two adventurous kids and a couple of spirited pets, all of whom share Rachel’s love of the ocean. Well, except the cat and dog. They’re both afraid of water. 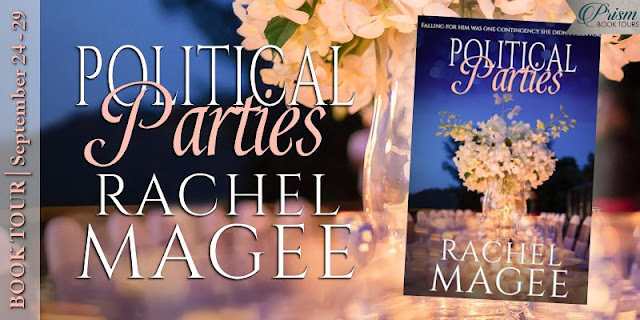 Find out more about what Rachel has been up to at rachelmageebooks.com. I enjoyed reading the excerpt, but I really loved your opinion of the book. I can’t wait to read this! Beautiful cover. I enjoyed the synopsis and enjoyed your review as well. I very much appreciate getting to find out about another book to read that my family can enjoy. Thanks so much for the info and the giveaway as well. The cover is lovely! And it’s always fun to see the ‘opposites attract ‘ story line work itself out.